AS IT STANDS: Don't be alarmed -- just get up fast and find the flying saucer! Don't be alarmed -- just get up fast and find the flying saucer! I recall when my three sons were little, waking them with music. You'd be wrong. I had a vinyl record of Snoopy and the Red Baron that featured the sounds of World War I planes in combat! At full volume, it never failed to bring them out of their beds in record (pardon the pun) time. I quit using this method when they hit their teens and loud music had no effect upon them. We didn't have alarm clocks in Army basic training. We woke up at the crack of dawn out of pure survival instinct. Having to wake up at a certain time has always been a challenge. The Greek philosopher Plato had a large water clock alarm that was said to sound like an organ. The goal of getting up at a prescribed time encompasses cultures throughout recorded history. The Roman senator Cassiodorus (c. 485-585) had a water clock. In China, a striking clock was made by the Buddhist monk and inventor Yi Xing (683-727). An Arab engineer named al-Kaysarani made a striking clock in Damascus, Syria in 1154. All of these devices utilize loud noise to do the job. It wasn't until James F. Reynolds and Paul L. Schroth Sr. came along in the 1940s that the first radio alarm clock was invented. It still made a loud noise, but you could wake up to music set at the volume you wanted. Now we have digital alarm clocks featuring all kinds of bells and whistles. They come with “snooze” buttons, and “sleep” buttons, and battery backup to maintain the time in the event of a power outage. The next-generation alarm clocks promise some pretty interesting stuff. 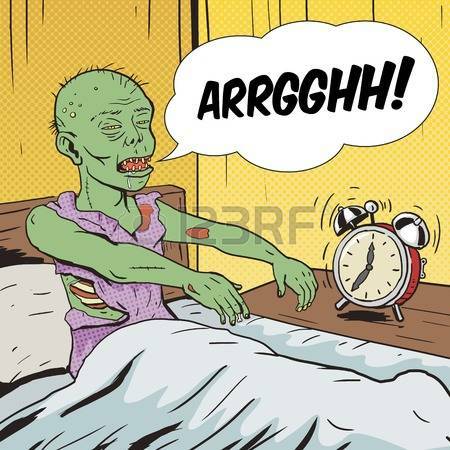 You know how it is when you suddenly wake up and feel kinda groggy? The clock gurus are promoting “Progressive” alarm clocks these days to address the problem. They involve stuff like a simulated sunrise (lights that slowly come on in phases), dawn simulators, and progressive auditory clocks. The Flying Alarm Clock is designed to get your rear end out of bed. It goes off at the time you set. The catch is, it literally goes off. The top portion flies off the base and lands somewhere in your room. It will continue to make a racket until you get up, find that flying saucer, and place it back on the base. The Drag Racing Alarm Clock is constructed to look like that Christmas tree at the local drag strip. All the lights, sounds and actions of the dragster make for a fun way to start your day. Imagine the engine revving up and the tires warming up, the staging lights showing your position and the starting lights going off in sequence. Then an 8,000 horsepower engine screams into action, sending you hurtling down the strip! For added effect, you can also have working temperature and humidity gauges. The Bomb Alarm Clock was invented by a Japanese company. Three minutes before it goes off, a voice starts a countdown. You have three minutes to disconnect a wire from the blinking light. If you make it in time you're fine. If not, be ready for a bang that will rock the house! Finally, there's the Sfera Alarm Clock that makes you get up whether you like it or not. It is mounted on the ceiling above your bed and when it goes off you simply reach up and touch it to turn it off. But wait! There's more. This alarm clock retracts toward the ceiling and goes off again, getting a little higher each time. At some point you'll find yourself standing on the bed trying to turn it off! As It Stands, my wife and I recently got an alarm clock that simulates a sunrise (slowly getting lighter), emits a scent called “energy,” and ends up with chirping birds. For the record, we slept in the first time we tried it!